This guide presents information on the Avocado basic design and its internals. The Job ID is a random SHA1 string that uniquely identifies a given job. A Test Reference is a string that can be resolved into (interpreted as) one or more tests by the Avocado Test Resolver. A given resolver plugin is free to interpret a test reference, it is completely abstract to the other components of Avocado. Mapping the Test References to tests can be affected by command-line switches like –external-runner , which completelly changes the meaning of the given strings. A test name is an arbitrarily long string that unambiguously points to the source of a single test. In other words the Avocado Test Resolver, as configured for a particular job, should return one and only one test as the interpretation of this name. This name can be as specific as necessary to make it unique. Therefore it can contain an arbitrary number of variables, prefixes, suffixes, tags, etc. It all depends on user preferences, what is supported by Avocado via its Test Resolvers and the context of the job. The output of the Test Resolver when resolving Test References should always be a list of unambiguous Test Names (for that particular job). Notice that although the Test Name has to be unique, one test can be run more than once inside a job. By definition, a Test Name is a Test Reference, but the reciprocal is not necessarily true, as the latter can represent more than one test. The varianter component creates different sets of variables (known as “variants”), to allow tests to be run individually in each of them. A Variant ID is an arbitrary and abstract string created by the varianter plugin to identify each variant. It should be unique per variant inside a set. In other words, the varianter plugin generates a set of variants, identified by unique IDs. A simpler implementation of the varianter uses serial integers as Variant IDs. A more sophisticated implementation could generate Variant IDs with more semantic, potentially representing their contents. A test ID is a string that uniquely identifies a test in the context of a job. When considering a single job, there are no two tests with the same ID. Test IDs don’t necessarily keep their uniqueness properties when considered outside of a particular job, but two identical jobs run in the exact same environment should generate a identical sets of Test IDs. Avocado at its simplest configuration can run three different types of tests . You can mix and match those in a single job. These are tests written in Python or BASH with the Avocado helpers that use the Avocado test API. To be more precise, the Python file must contain a class derived from avocado.test.Test. 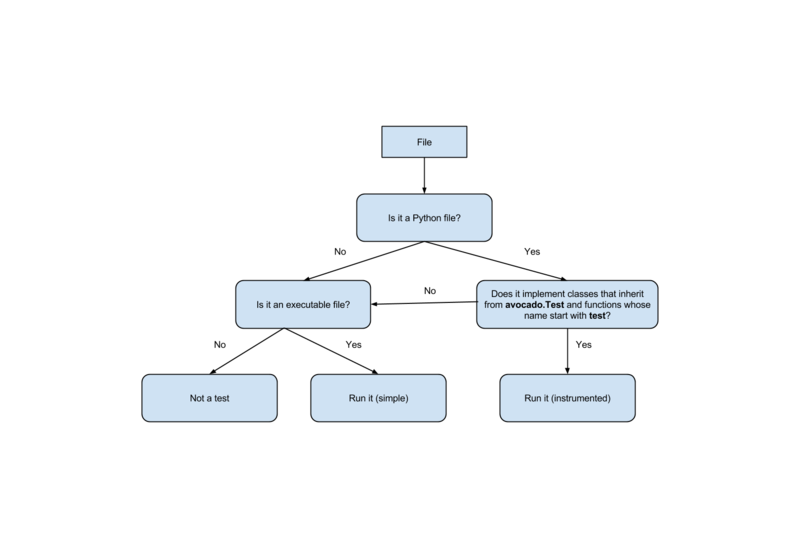 This means that an executable written in Python is not always an instrumented test, but may work as a simple test. The instrumented tests allows the writer finer control over the process including logging, test result status and other more sophisticated test APIs. Test statuses PASS, WARN, START and SKIP are considered as successful builds. The ABORT, ERROR, FAIL, ALERT, RUNNING, NOSTATUS and INTERRUPTED are considered as failed ones. The discovery of classical python unittest is also supported, although unlike python unittest we still use static analysis to get individual tests so dynamically created cases are not recognized. Also note that test result SKIP is reported as CANCEL in Avocado as SKIP test meaning differs from our definition. Apart from that there should be no surprises when running unittests via Avocado. Any executable in your box. The criteria for PASS/FAIL is the return code of the executable. If it returns 0, the test PASSes, if it returns anything else, it FAILs. `PASS`: The test passed, which means all conditions being tested have passed. `FAIL`: The test failed, which means at least one condition being tested has failed. Ideally, it should mean a problem in the software being tested has been found. `ERROR`: An error happened during the test execution. This can happen, for example, if there’s a bug in the test runner, in its libraries or if a resource breaks unexpectedly. Uncaught exceptions in the test code will also result in this status. `SKIP`: The test runner decided a requested test should not be run. This can happen, for example, due to missing requirements in the test environment or when there’s a job timeout. The Avocado libraries and its APIs are a big part of what Avocado is. But, to avoid having any issues you should understand what parts of the Avocado libraries are intended for test writers and their respective API stability promises. At the most basic level there’s the Test APIs which you should use when writing tests in Python and planning to make use of any other utility library. The Test APIs can be found in the avocado main module, and its most important member is the avocado.Test class. By conforming to the avocado.Test API, that is, by inheriting from it, you can use the full set of utility libraries. The Test APIs are guaranteed to be stable across a single major version of Avocado. That means that a test written for a given version of Avocado should not break on later minor versions because of Test API changes. There are also a large number of utility libraries that can be found under the avocado.utils namespace. These are very general in nature and can help you speed up your test development. The utility libraries may receive incompatible changes across minor versions, but these will be done in a staged fashion. If a given change to an utility library can cause test breakage, it will first be documented and/or deprecated, and only on the next subsequent minor version it will actually be changed. What this means is that upon updating to later minor versions of Avocado, you should look at the Avocado Release Notes for changes that may impact your tests. Finally, everything under avocado.core is part of the application’s infrastructure and should not be used by tests. Extensions and Plugins can use the core libraries, but API stability is not guaranteed at any level. It’s important to note that the inspection mechanism is safe (that is, python classes and files are not actually loaded and executed on discovery and inspection stage). Due to the fact Avocado doesn’t actually load the code and classes, the introspection is simple and will not catch things like buggy test modules, missing imports and miscellaneous bugs in the code you want to list or run. We recommend only running tests from sources you trust, use of static checking and reviews in your test development process. Due to the simple test inspection mechanism, avocado will not recognize test classes that inherit from a class derived from avocado.Test. Please refer to the Writing Avocado Tests documentation on how to use the tags functionality to mark derived classes as avocado test classes. A human readable id in the top level, with the job SHA1. Subdirectory jobdata, that contains machine readable data about the job. A machine readable results.xml and results.json in the top level, with a summary of the job information in xUnit/json format. A top level sysinfo dir, with sub directories pre, post and profile, that store sysinfo files pre/post/during job, respectively. Subdirectory test-results, that contains a number of subdirectories (filesystem-friendly test ids). Those test ids represent instances of test execution results. A sysinfo subdir, with sub directories pre, post and profile that store sysinfo files pre test, post test and profiling info while the test was running, respectively. A data subdir, where the test can output a number of files if necessary. Each test is executed in a separate process. Due to how the underlying operating system works, a lot of the attributes of the parent process (the Avocado test runner) are passed down to the test process. On GNU/Linux systems, a child process should be “an exact duplicate of the parent process, except” some items that are documented in the fork(2) man page. The standard input (STDIN) is set to a null device. This is truth both for sys.stdin and for file descriptor 0. Both will point to the same open null device file. The standard output (STDOUT), as in sys.stdout, is redirected so that it doesn’t interfere with the test runner’s own output. All content written to the test’s sys.stdout will be available in the logs under the output prefix. The file descriptor 1 (AKA /dev/stdout, AKA /proc/self/fd/1, etc) is not currently redirected for INSTRUMENTED tests. Any attempt to write directly to the file descriptor will interfere with the runner’s own output stream. This behavior will be addressed in a future version. The standard error (STDERR), as in sys.stderr, is redirected so that it doesn’t interfere with the test runner’s own errors. All content written to the test’s sys.stderr will be available in the logs under the output prefix. The file descriptor 2 (AKA /dev/stderr, AKA /proc/self/fd/2, etc) is not currently redirected for INSTRUMENTED tests. Any attempt to write directly to the file descriptor will interfere with the runner’s own error stream. This behavior will be addressed in a future version. A custom handler for signal SIGTERM which will simply raise an exception (with the appropriate message) to be handled by the Avocado test runner, stating the fact that the test was interrupted by such a signal. By following the backtrace that is given alongside the in the test log (look for RuntimeError: Test interrupted by SIGTERM) a user can quickly grasp at which point the test was interrupted. If the test handles SIGTERM differently and doesn’t finish the test process quickly enough, it will receive then a SIGKILL which is supposed to definitely end the test process. A number of environment variables that are set by Avocado, all prefixed with AVOCADO_. If you want to see for yourself what is described here, you may want to run the example test test_env.py and examine its log messages. Avocado provides interfaces with which custom plugins can register to be called at various times. For instance, it’s possible to trigger custom actions before and after the execution of a job, or before and after the execution of the tests from a job test suite. Let’s discuss each interface briefly. Avocado supports plug-ins which are (guaranteed to be) executed before the first test and after all tests finished. The interfaces are avocado.core.plugin_interfaces.JobPre and avocado.core.plugin_interfaces.JobPost, respectively. The pre method of each installed plugin of type job.prepost will be called by the run command, that is, anytime an avocado run <valid_test_reference> command is executed. Conditions such as the SystemExit or KeyboardInterrupt execeptions being raised can interrupt the execution of those plugins. Then, immediately after that, the job’s run method is called, which attempts to run all job phases, from test suite creation to test execution. Unless a SystemExit or KeyboardInterrupt is raised, or yet another major external event (like a system condition that Avocado can not control) it will attempt to run the post methods of all the installed plugins of type job.prepost. This even includes job executions where the pre plugin executions were interrupted. Plugin writers can have their own code called at Avocado during a job by writing a that will be called at phase number 2 (pre_tests) by writing a method according to the avocado.core.plugin_interfaces.JobPreTests() interface. Accordingly, plugin writers can have their own called at phase number 4 (post_tests) by writing a method according to the avocado.core.plugin_interfaces.JobPostTests() interface. Note that there’s no guarantee that all of the first 3 job phases will be executed, so a failure in phase 1 (create_test_suite), may prevent the phase 2 (pre_tests) and/or 3 (run_tests) from from being executed. Now, no matter what happens in the attempted execution of job phases 1 through 3, job phase 4 (post_tests) will be attempted to be executed. To make it extra clear, as long as the Avocado test runner is still in execution (that is, has not been terminated by a system condition that it can not control), it will execute plugin’s post_tests methods. As a concrete example, a plugin’ post_tests method would not be executed after a SIGKILL is sent to the Avocado test runner on phases 1 through 3, because the Avocado test runner would be promptly interrupted. But, a SIGTERM and KeyboardInterrupt sent to the Avocado test runner under phases 1 though 3 would still cause the test runner to run post_tests (phase 4). Now, if during phase 4 a KeyboardInterrupt or SystemExit is received, the remaining plugins’ post_tests methods will NOT be executed. Avocado ships with a plugin (installed by default) that allows running scripts before and after the actual execution of Jobs. A user can be sure that, when a given “pre” script is run, no test in that job has been run, and when the “post” scripts are run, all the tests in a given job have already finished running. AVOCADO_JOB_STATUS: the current status of the job. AVOCADO_JOB_LOGDIR: the filesystem location that holds the logs and various other files for a given job run. Note: Even though these variables should all be set, it’s a good practice for scripts to check if they’re set before using their values. This may prevent unintended actions such as writing to the current working directory instead of to the AVOCADO_JOB_LOGDIR if this is not set. Finally, any failures in the Pre/Post scripts will not alter the status of the corresponding jobs. It’s possible to register a callback function that will be called when all the tests have finished running. This effectively allows for a test job to clean some state it may have left behind. At the moment, this feature is not intended to be used by test writers, but it’s seen as a feature for Avocado extensions to make use. To register a callback function, your code should put a message in a very specific format in the “runner queue”. The Avocado test runner code will understand that this message contains a (serialized) function that will be called once all tests finish running. This results in the my_cleanup function being called with positional argument cleanup_file. Because once was set to True, only one unique combination of function, positional arguments and keyword arguments will be registered, not matter how many times they’re attempted to be registered. For more information check avocado.utils.data_structures.CallbackRegister.register(). Avocado INSTRUMENTED tests, those written in Python and using the avocado.Test API, can make use of special directives specified as docstrings. To be considered valid, the docstring must match this pattern: avocado.core.safeloader.DOCSTRING_DIRECTIVE_RE_RAW. The marker, which is the literal string :avocado:. The content, a string that follows the marker, separated by at least one white space or tab. The “content”, which follows the marker and the space, must begin with an alphanumeric character, that is, characters within “a-z”, “A-Z” or “0-9”. After at least one alphanumeric character, the content may contain the following special symbols too: _, ,, = and :. An end of string (or end of line) must immediately follow the content. Avocado normal operation is related to run code written by users/test-writers. It means the test code can carry its own handlers for different signals or even ignore then. Still, as the code is being executed by Avocado, we have to make sure we will finish all the subprocesses we create before ending our execution. SIGSTP/Ctrl+Z: On SIGSTP, Avocado will pause the execution of the subprocesses, while the main process will still be running, respecting the timeout timer and waiting for the subprocesses to finish. A new SIGSTP will make the subprocesses to resume the execution. SIGINT/Ctrl+C: This signal will be forwarded to the test process and Avocado will wait until it’s finished. If the test process does not finish after receiving a SIGINT, user can send a second SIGINT (after the 2 seconds ignore period). The second SIGINT will make Avocado to send a SIGKILL to the whole subprocess tree and then complete the main process execution. SIGTERM: This signal will make Avocado to terminate immediately. A SIGKILL will be sent to the whole subprocess tree and the main process will exit without completing the execution. Notice that it’s a best-effort attempt, meaning that in case of fork-bomb, newly created processes might still be left behind. Avocado plugins can introduce additional test types.